Innovative international collaborations and strategic government support, especially from countries with advanced technologies such as the United States, will be critical in bringing next generation nuclear designs to market and deploying them at scale. Developing countries like China, which announced last month that it would move ahead with plans for new nuclear power plants, are particularly keen on new reactor models. Above, construction of the Changjiang Nuclear Power Plant Phase II gets underway in southern China’s Hainan province in April, 2010. As the debate over climate policy picks up again in the wake of Hurricane Sandy and President Obama’s reelection, policymakers should prioritize efforts that will accelerate the adoption of zero-carbon technologies, especially the only proven baseload source available: next generation nuclear. Whereas traditional nuclear reactors from the 1950s were designed in secret, advanced models are being researched, designed, and financed by innovative international collaborations. Take GE-Hitachi’s PRISM, a joint American-Japanese venture to construct a power plant in the United Kingdom capable of processing plutonium. Or the recent announcement that South Korea’s national electric utility, KEPCO, had been awarded a contract to build the first nuclear plant in the United Arab Emirates, using Australian-mined uranium for fuel. An expanding international community recognizes the importance of developing advanced nuclear reactor designs to meet energy needs and address global warming. Thirteen countries have joined the Generation IV International Forum (GIF), for instance, a cooperative endeavor to encourage governments and industry to support advanced nuclear energy concepts. Member countries, which include the United States, Japan, Russia, and China, have agreed to expand R&D funding for advanced nuclear projects that meet stringent sustainability, economic, safety and nonproliferation goals. Yet despite international agreement on the necessity of next generation nuclear systems, there is a dearth of support at the national level. In the US, annual federal RD&D spending for advanced fission reactors has not exceeded $200 million in the last 10 years, following much larger budgets through the 1970s to mid-1990s. The majority of research and investment in advanced nuclear systems today comes from Asia, and most new nuclear is constructed in developing nations. Yet many of the countries most interested in building more nuclear are largely stuck with old Generation II designs. Private industry appears ready to take a leadership role in the development and deployment of advanced nuclear builds, but the right government incentives, international agreements and support structures must be in place for this to occur. GE-Hitachi, for example, submitted a proposal last year to build a pair of next generation modular fast reactors in the UK, the first commercial advanced nuclear plant. These “PRISM” reactors are based on an Integral Fast Reactor (IFR) design that is widely considered one of the most promising next generation models (see this white paper by Breakthrough Senior Fellow Barry Brook and Tom Blees of the Science Council for Global Initiatives). In addition to providing clean electricity, PRISM reactors would burn weapons material, offering a cost-effective solution to the UK’s plutonium disposal problem. If built, the reactors would be able to process all of the UK’s stockpiled plutonium within five years and then generate decades of clean energy, in addition to providing a full commercial demonstration of the technology. Other European countries and the United States should seek out and support these win-win scenarios, where an advanced clean technology can be demonstrated while also solving a separate policy problem. 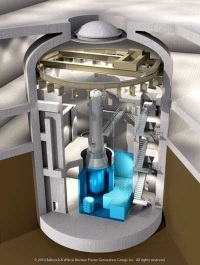 Advanced nuclear technologies and small modular reactors (SMRs) are being actively researched and designed, particularly in nations where governments recognize the strategic necessity of nuclear energy in the future energy mix – China, South Korea, United Arab Emirates, and others. Further research is required to understand how governments can best advance next generation nuclear designs, but many of the policies that have helped renewable technologies succeed – federally backed loan guarantees, feed-in tariffs, access to public lands for demonstration projects, and others – show signs of promise. Yet the initial development and deployment of advanced nuclear, which is required to give confidence to commercial utilities to build these at a large scale, is not occurring fast enough. It is time that the United States and European countries recognize advanced nuclear as a potentially crucial component of a clean-energy transition. Without the rapid deployment of nuclear power, our energy needs will probably continue to be met predominately by fossil fuels, and the oft-cited 2°C global warming target will almost certainly not be met. Jessica Lovering is a policy analyst, and Max Luke is a policy associate, in the Breakthrough Institute’s Energy & Climate program. Barry Brook is a Breakthrough Senior Fellow. Follow Jessica and Barry on Twitter: @J_Lovering and@BraveNewClimate.